And this avoided a join and sort which was being done for row... Did a single sort a hash join and an update based on RID... Wow!!! Hello all... Reviewing queries while development and fixing performance issues in SQLs are part of my job... I get lot of queries where people have written a really bad query and thank god we have this process in place to tune such queries... You can take this as a sequel to my Post on "Anti SQL Logic"
This will help you categorize stats in column wise fashion where current period columns will be holding actual value and 2nd set of columns will be holding data for other periods. I really could not justify the Writes (but it struck me much later) but had an idea about reads... Also, at the design I had done for tablespace included some reserve for prefetching/blocked I/O... They were performing poor... Ooopss!!! So what next??? Probably some SQL Tuning tips!!! Till then HAPPY PREFETCHING!!! select * from transaction_posting_table where txn_posting_date)>='2010/04/30' and txn_posting_date)<'2010/04/30'+1 Kwel??? 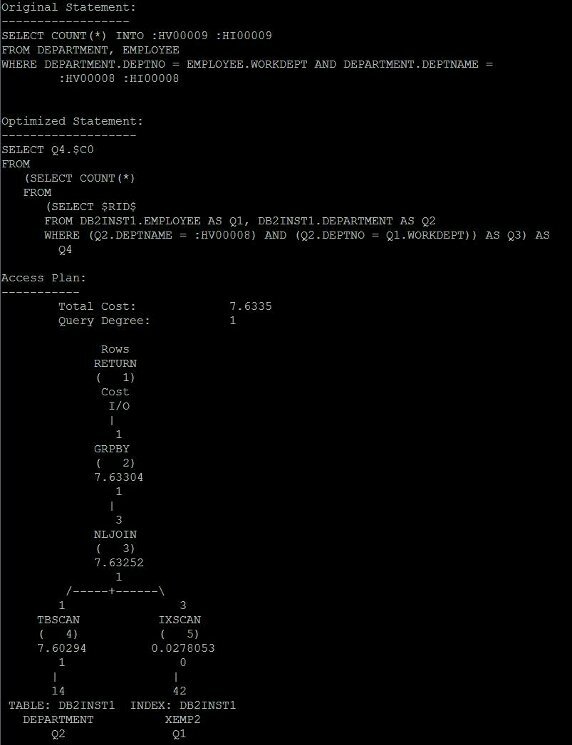 3) Another famous interview question is (I have never asked this one) "Write a query to find the 2nd max salary from emp table". But I know it will send across a smile on many faces... (Yeah I know that, I did that in my graduation viva!!!...) So is this what you are thinking? This again might not go for an index scan on either of the column and might go for a hash join. A better way would be to Use IN... Wondering how??? Hi guys!!! I am back... n back as an IBM Information Champion (yup got selected for 2011 :) ) !!! "db2 does it automatically n won't impact the current processes by much fraction... More over if you automate it urself, you will update stats for all the tables, even if they did not change much (or not at all) so its better we leave it to db2..."
This step will capture the explain information in the explain tables. db2exfmt can be either invoked with arguments or can be invoked in interactive mode. -o / -t will let you re-direct the output to an output file or to your terminal. 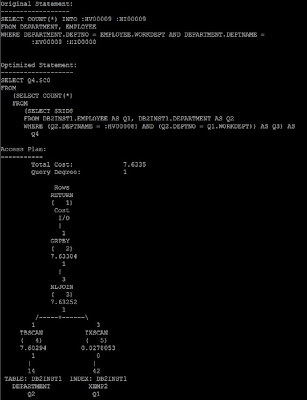 db2 performance: How to convey performance metrics from SNAPSHOT vi...: "I had recently participated in db2 has talent and was lucky to be selected for finals... I missed the finals though due to my travel schedul..."
4) SQLs which are spending too much time on I/O and fetching lesser no of rows i.e. I hope above metrics and monitor elements help any one who reads this blog. I have kept the column alias as elaborate (to convey the meaning they carry) as possible. I might have ignored the parameters like STMT_USR_CPU_TIME_S and STMT_USR_CPU_TIME_MS but they are equally important. These snapshot elements mentioned by me will help you super tune your application, once you have already tuned the long running sqls and have indexed the database properly!!! Would like to acknowledge the encouragements received from reader of previous blogs (the increasing no of views every time i opened this page is a boost factor) and Susan Visser (whose tweets inspired me to continue writing the blog)!!! Will continue writing!!! db2expln is next to come!! !